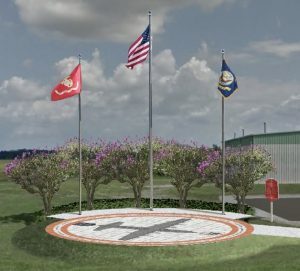 A marble monument honors 15 Marines and a U.S. Navy corpsman who died in a 2017 plane crash near Itta Bena, Mississippi. The monument is named Yanky 72 for the aircraft’s call sign. Clifton Addison was the memorial committee chairman whose fundraising raised more than $100,000 for the memorial. In memory of the brave marines navy corpsman who lost their lives near this spot on July 10, 2017.